This 3 Minute Miracle Reconstruction Deep Conditioner is my favourite product from this range! Firstly the bottle is amazing, so easy to use, literally pick it up and squeeze the conditioner into your hand. No fussing around trying to open lids, especially when your hands are already soapy from the shampoo. Secondly it literally works miracles, after combing and leaving this creamy conditioner in my hair for 3 minutes its left me with light and soft but strong, shiny and healthy locks. Aussie really delivers on their “Reconstruct” promise, 3 Minute Miracle Reconstruction Deep Conditioner has breathed life into my poor dry damaged hair which is subjected to highlights and heat styling on a regular basis. The product really does speak for itself, and you instantly see results from the very first time you use this thirst quenching (for your hair) miracle treatment. Telling anyone who will listen to that this at the very least they should give this range a try! This product claims to smooth split ends and roughened cuticles and transform dry, damaged hair into manageable shiny locks, and it really works. Although I just had my hair trimmed the day prior to receiving the products and my split ends were removed, I noticed that my hair was smoother and softer and smelled really good. The packaging is very practical and unique, after my first use it leaked a drop or two but after that it worked perfectly, I was so impressed. The colour of the conditioner was a surprise as I’m used to pure white conditioners but it was pleasant and you feel like you’re using something special. The consistency is like most conditioners. I have received compliments on the softness of my hair from my boyfriend and my best friend. My boyfriend also has long hair and he tried some and it worked wonders. I will repurchase this product if it is not too expensive and would probably buy my best friend some too. I am so impressed with his product but, I used it in conjunction with the shampoo and conditioner so I hope it works just as well alone. This I use once a week and already after two uses I have noticed a visible difference in my hairs condition. It is no longer so rough and frizzy at the ends. This comes in a tube, which is bright orange on white, and you squeeze out a small amount, which you work into your hair. Unlike most intensive treatments, you only need to keep it in your hair for 3 minutes and this is at least a time saver. It has definitely improved the overall texture of my hair and the smell is also sweet and long lasting. This has to be one of my favourite products in this range. The packaging is eye catching but it is a bit tricky once you remove the seal it cannot close again. All that is required is a squeeze and a generous amount is in your hand. I absolutely love the floral scent. The product is convenient to use as it can be applied for about 3 minutes or longer depending on how much of a treatment it requires. Personally I needed this treatment to be kept on for a lot longer. The purpose of this deep conditioner is to help reconstruct damaged hair, smoothing hair and leaving it manageable and shiny. Their magical formula, which includes an ingredient included called Australian Balm Mint, miraculously mends split ends and repairs cuticles. I have not been using it that long to notice any of my split ends mended but this miracle has indeed changed my hair for the better. My hair feels softer, shinier and I am able to manage my hair without any hassle. My hair feels healthier and shiny and people are seeing a difference in my hair, which I love! I just love what this is doing for my hair. I would definitely purchase it again and recommend it to people who have damaged and dry hair. My miracle in a bottle. Aussie’s packaging for their 3 minute deep conditioners is cute, functional and smart. I love that there’s no fiddling with caps when your hands are already slippery and you just want to get to the product. You just squeeze the bottle and it squirts out from the bottom end with no mess and you can just pop it back on the shelf. In the past, I would apply a hair mask every Sunday by applying a generous amount of product to my towel-dried hair, twisting it into a loose bun and then wrapping cling wrap around my hair. I did it because I wouldn’t have to lean over the basin for 10 – 20 minutes as per the instructions, at least I could do chores around the house and still be productive while I treat my hair. Now that is definitely a thing of the past because Aussie’s 3 minute miracle conditioner acts just like a deeply nourishing hair mask without any fuss or time being wasted. My hair is super soft and bouncy without any heaviness to it. Aussie weren’t kidding around when they named it the 3 minute miracle reconstruction deep conditioner, it’s the truth. It helps for damaged hair and split ends. I am impressed with the packaging as it can stand upside down and it does not leak. The bottle has a nice grip so you can hold it in your one hand. The smell is sweet and scented leaving your hair smelling great. The consistency of Aussie 3 Minute Miracle is thick so you don’t need to use a lot. My hair is looking very healthy and beautiful. The product lasts longer than other treatments. I am very satisfied with Aussie 3 Minute Miracle Reconstructor. I will buy the product again and recommend it to my friends. This little bottle is a true gem! If you enjoy the Mega Shampoo and Mega Conditioner, the 3 Minute Miracle Reconsctructor is definitely the icing on the cake. It comes in an innovative squeeze bottle, which ensures zero wastage (of both product and time!). After using the shampoo and conditioner, you simply squirt out a measure in your hand (the amount may vary depending on how long/damaged your hair is), and work it through your hair. This product is wonderful because you can feel it working from the moment you apply it – it’s as if the hair absorbs the Miracle Reconstructor! Relax for a minute, or three, enjoy the simply intoxicating scent, and wash out. You should be able to feel the difference the moment you start rinsing your hair. I have never felt a faster, silkier, more fragrant transformation before. However, the first time I used this product, I made the mistake of applying it too close to my scalp, which made my hair oily pretty quickly. Be sure to use this product sparingly, and to apply only to the mid-lengths and ends of your hair – as you would conditioner. My final take on the Aussie Street Art Range? Allow yourself to be seduced by the scent. These products will feed both your hair, and your senses. My vocabulary does not know enough words to glorify this product. I have never had such amazing results before! The Conditioner needs to be used after shampooing, and it’s meant to be left in for between 1 to 3 minutes, or more if you like. I found that 3 minutes was just right. It has a slightly thick consistency and spreads very easily into the hair, coating each strand as you massage it in. The scent is divine, and very different, relaxing and slightly flowery… quite a nice change from the usual. My hair was far more manageable than ever. I can’t describe how smooth and shiny it was! In fact, after a week of use, I actually did get comments on how much nicer my hair looked! I love the bottle! It’s a squeeze bottle that is leak proof. Very convenient! One squeeze dispenses just the right amount for medium length hair. I used this twice a week and the results were phenomenal. This is an absolute winner! This product is aimed at providing deep conditioning in 3 – 5 minutes for severely damaged hair, smoothing split-ends and conditioning rough hair cuticles. The packaging is a sturdy, white plastic squeeze bottle (think All Gold Tomato Sauce Squeeze Bottle) and has the graffiti art branding on the front, which is eye-catching. There is no lid covering the spout. Initially I was concerned about leakage but the product is thick enough and does not move unless the bottle is squeezed. And there is a ridge on the inside of the spout to prevent unnecessary spilling. It smells like passion fruit sherbet but the scent is subtle and three days after washing, I could still indistinctly smell it. After 4 uses, I noticed that my hair is softer and somewhat more manageable with reduced frizz. I think long-term use would provide the best results. I would definitely recommend it to anyone looking for a quick deep treatment. It smells great, the packaging is attractive and it does what it says it will do. People noticed the smell and softness of my hair after use. I love the design of this 3 minute miracle reconstruction deep conditioner, it’s unique and convenient. You don’t have to open and close it, you just have to squeeze the bottle when you want to use it. The graffiti design on the bottle is appealing and eye-catching. The Street Art Limited Edition 3 Minute Miracle Reconstruction Deep Conditioner smells amazing it has a strong floral scent that lingers on. It can easily double as a room freshener as it made my entire bathroom smell amazing. The conditioner is white in colour and the consistency of the conditioner is thick. After using this product my hair felt very soft and had a healthy shine to it. This is my new favourite hair product. I’ll definitely recommend it to all my friends and family. This product promises to sooth split ends and to transform dry, damaged hair into manageable and shiny hair in just 3 minutes. The first thing I noticed was the bottle, it has a street art design like the Mega Shampoo and Conditioner, but this bottle has a dispenser at the bottom so all you need to do is squeeze, no need to hassle with caps. This makes the application a dream to work with. It has a refreshing smell that isn’t overpowering. I have very long hair with a few split ends and sometimes get breakage especially with it being long so I really got excited when I saw this product as it claims to help just that. I felt a difference from the moment I applied it, it left my hair feeling silky and almost a “calm” feeling. My hair was also less frizzy and really manageable. This is a great deep conditioning product for anyone with dry, damaged hair like mine and I would highly recommend it to anyone with the same problems. 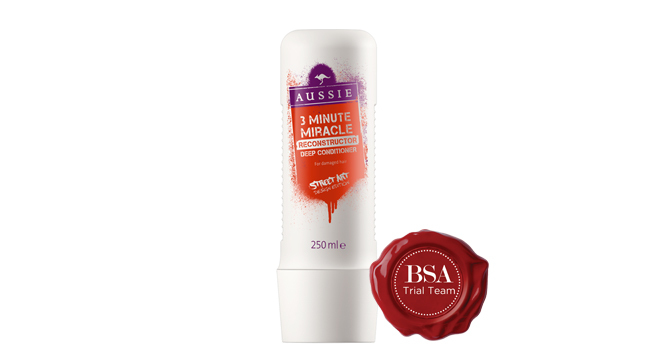 The Aussie 3 Minute Miracle Reconstructor Deep Conditioner truly is like a miracle in a bottle! When I applied the product, it seemed to be of a much thinner consistency than other treatment products that I have used before. And I was a little worried about how this would affect its efficiency. But wow, was I pleasantly surprised! My hair was silky soft and shiny after I used this conditioner only once! And 3min is really not a long time to have to wait for it to work its magic. It also rinsed out very easily, without the feeling of product still being left behind, like I often experience with other treatment products. The bottle that this product comes in is also unlike anything I have ever seen. There is no screw off or flip open lid. Instead it has a very cleverly designed opening that allows you to simply squeeze the bottle, and the product is dispensed in a neat little squirt, and as soon as you stop squeezing, it closes again and seals up perfectly. off my hair now by leaving it loose. Before I had it always in a bun trying to hide away the damage. An affordable salon quality treatment is how I rate this Miracle Reconstructor from Aussie. The Packaging has style and comes in a white bottle with easy to use cap for exact dose needed. This is truly a miracle product. With my hair type I don’t treat my hair regularly. As per the packaging, I’m growing to like the kangaroo symbol, still not sure what it’s suppose to mean. I love the instructions at the back for people like myself that always get things wrong, directions are key in any situation. I was a bit worries what would happen after my first use as the bottle is designed in away that once opened it stays opened, but what a relief once I saw the suction cap. I didn’t use this treatment on my own hair as I knew the result would turn out very oily, instead I had a girls night and pampered my guests by treating their hair. They also thought the scent was lovely and felt very relaxed. I could see the results on their hair, nice and healthy and it also put a bit of a puffed up look into the strand. This product is the way to go if you need a good home/do it yourself treatment. This deep conditioner helps repair dry, damaged hair in just 1-3 minutes, depending on how damaged the hair is. It leaves the hair smoother and shiny, not to mention smelling great. The packaging is practical, you have to squeeze the bottle for the product to come out so it will not easily spill or run out, also due to its consistency. The packaging is colorful and fun. This deep conditioner smells great, just like the shampoo and conditioner from this Aussie range. The consistency is thick and creamy just like that of a conditioner. Since I have been using this deep conditioner my hair feels really smooth and just looking healthy and supple. The bottle should last for a while depending on length of the hair and how often the hair needs some much needed treatment. I have long hair so I like to use quite a bit so I don’t miss any part of my hair. I am happy with this product and will continue using it; it is affordable and good value for money. I found the 3 Minute Miracle Reconstruction Deep Conditioner to be intensely conditioning. It really penetrates the dry and damaged hair. I have very fine and slightly damaged ends and I had radiant hair after just one use. My hair has definitely been more moisturised after using this product for a week. It’s a very effective conditioner. It does not weigh the hair down nor does it leave the hair greasy or oily. It has the most amazing smell; it smells good enough to eat. My only complaint is that the lid of the bottle doesn’t seal. Once the little sticker disc has been removed, there is a hole at the top of the bottle. Regardless of the bottle, based on the results I will continue to use the 3 Minute Miracle Reconstruction Deep Conditioner. I found the upside down bottle user friendly, but the label closing the opening at the bottom did not do it for me. The conditioner smells pleasant enough, but nothing to jump over the moon about. Contains Australian Balm Mint extract that promises to smooth split ends and roughened cuticles. It also promises to help transform dry, damaged hair into manageable and shiny locks in just 3 minutes. I have long thick wavy hair that tangles quite a lot in the humid Durban summer and I therefore need a conditioner that can assist with this. I had to use a lot of this conditioner to cover my thick mane and had to keep it on for about 8 minutes to start working and leave my mane more manageable. It does leave hair feeling soft and shiny as promised. At R84.99 a bottle, it makes the price too steep for me. As I have to use such a lot on my long thick mane, this product will just not be cost-effective enough. FINAL VERICT: It delivers on its promises of leaving dry and damaged hair more soft, shiny and manageable. As I have to use a lot to accomplish this, I will have to say that I will rather stay with my current nourishing conditioner that accomplishes more in a shorter time and works out cheaper and more cost-effective. To use this product, a seal at the bottom of the bottle has to be peeled off and the product can be squeezed out by pressing the bottle. The consistency is thick and has a ‘peachy’ colour. The essential oil in Australian Balm Mint, has a naturally sweet scent, to me it smells like scented candles. The treatment is between 1-3 minutes depending on how damaged the hair is. My hair is now shiny, manageable and healthy. Great product and I highly recommend it. This was the first product I used when I received the Street Art Edition, my hair was seriously in need of some care and this product was exactly what I was looking for. I coated my hair in a fair amount of this miracle worker and let the magic begin. I left it for around five minutes to be sure, and once I rinsed out the product WOW! Soft silky hair, I didn’t have any frizz, any fly aways, in fact my hair even looked so glossy, I promise it could have been mistaken for using hair gloss serum. My hair had never looked so amazing before, I use this on my hair at least twice a month to give my hair that extra hair care. I really wasn’t so happy with the bottle though it didn’t have a way to actually close, the product didn’t leak out because I kept it upside down, and I know it was built for convenience but it wouldn’t make it easy to travel with though.